Creating a focal point in your backyard space is the perfect way to update the look of your home. One way to utilize your outdoor area is by building a trellis for growing your favorite flowers and vegetables. Use natural items that evoke the feeling of being outdoors, like twigs and branches. Scout your backyard for old tree limbs and branches you can recycle into a rustic trellis. If you have a small patio, you can plant the trellis into an outdoor container. During the summer months, plant tomatoes and cucumbers to meander up the structure. When you have limited space but love to garden, a trellis is the perfect vertical structure that does not take up a ton of space. 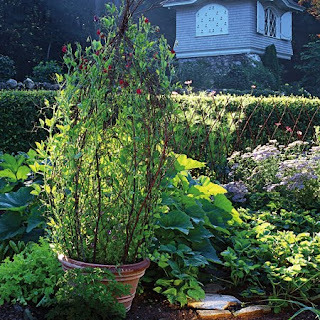 In the cool months of fall and winter, plant vines like grapevines and jasmine that will produce sweet fruits and colorful blooming flowers throughout the winter. 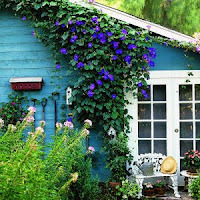 If you don't have space for a trellis, you can also use the side of your home for supporting colorful vines. Electric blue morning glories creates a stunning design and focal point to your home. Train them to grow around an outdoor window or set of french doors for a stunning look. Wake up early and enjoy watching the blossoms pop open. As the day progresses, the blooms will begin to swirl to a close. © Design Your Revolution | All rights reserved.